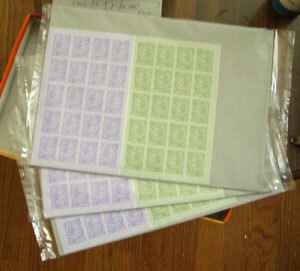 I ordered the postage stamps online and they come very neatly packaged in plastic with a cardboard to support it. It's very convenient -- no waiting on line, dealing with incompetent ppl, or tracking down about 300 of the exact same type of stamps. It just costs $1 extra for shipping, which I think is well worth it. And it was delivered fairly quickly. I think I made out pretty well, considering nice invites cost upwards of $2 nowadays. I think for a similar style it would have cost at least $5/invite. 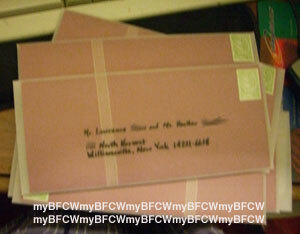 And postage stamps cost about $70 (but not part of "making the invitation" so I didn't include it above). Lastly, there was a lot of blood, sweat, and tears when discussing the layout and wording, and hardly anyone has noticed that (insert befuddled, hardly amused, mostly aggravated face here). I really like your map for your guests! WOW! Your invitations look awesome! Love your invites. You did a great job. I've been trying to find the perfect double happiness image to make a stamp out of and have been unsuccessful. Would you mind sharing your double happiness image with me? I love your wedding invites! They're beautiful! I'm quite interested in the way you designed the map. 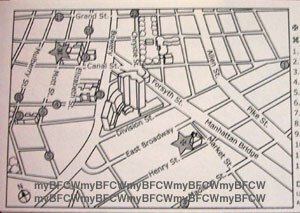 If you have time, can you please show me step by step on how you did it on Google Earth and how the general directions were derived? I am currently finding a way to create a map like yours. It will help a lot! Thank you! Please e-mail be @ serenabeana7@yahoo.com . My name's Jen. I came across your site while searching for wedding invitation ideas and I have to say your invitations are awesome! I, too, have a bit of a problem finding a double happiness image to customize a stamp for the invitations I'm working on for a friend. If you could please email me the double happiness template I would greatly appreciate it and plus it would be a life safer as well. =D My email address is aznx55@yahoo.com. Thank you so much in advance!! I'm getting a lot of help from you blog. Thank you for documenting about your experience so diligently. 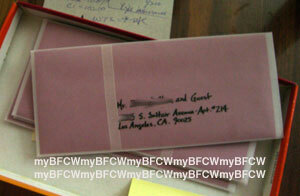 I was wondering in your research if you came across any of that traditional Chinese scented wedding invitation paper. I've been trying to find some, or at least the scent, and have had little luck over here in the West Coast. Sorry, I haven't come across any of the traditional Chinese scented paper. You may want to research something in relation to "rose scent" because I think I once read that that's what that scent is called. Hope that helps! Hi, I LOVE your invitations. 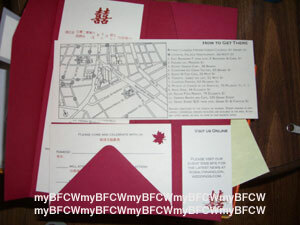 I have a Chinese wedding that I am working on right now (wedding planner), and my bride wanted to know the wording you used for the invitation, and what size your pocket fold envelope was. Would you mind emailing me at michele@infuseevents.com? Thank you! Hi, your invitation is very beautiful and creative. I'm trying to create my own invitation also, was wondering if you can help me with the Chinese wording. 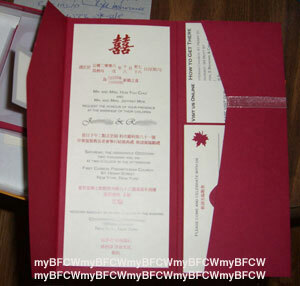 Did you use a translator for the Chinese wording of the invitation? lientim80, my parents translated the invitation using past invitations that we've received. I can barely read/write Chinese, so unfortunately I'm not of much help. Sorry! I can send you the wording that I used and maybe you can copy most of it? Just post your email here and I can send it to you or email me at rm47of450 at yahoo. Hi! 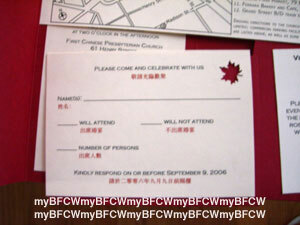 can you email me your chinese invite wording in word format? Thanks!! oops.. my email is melan731@gmail.com Thanks!! 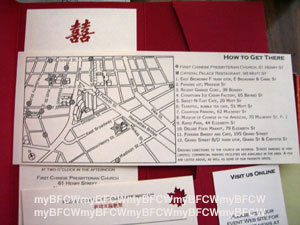 Could you please send me the double happiness template as well as the Chinese invite wording. Thanks! I think your work is brilliant. Postage stamps: One other idea is to Not use a regular postage stamp but to go to a stamp dealer and buy older not used postage stamps. You could end up with a couple of stamps... maybe even something with an asian theme. This is one way around the idea that you don't like what stamps are available today.